Student loans, credit cards, taxes, currency itself… I am terrified and exhausted by debt. It seems like every waking hour could persistently push me down a deeper and more damaging money hole. Financial institutions throw themselves at us, shouting to anyone who'll listen that they're pre-approved for a low, low monthly rate. If you're not worried about your credit score, you should be. It determines how much more you can borrow, how much more you can volunteer your life against, how much more you can buy! I wonder why I enjoy playing Animal Crossing games at all. My relationship with perennial loan shark Tom Nook started back on Gamecube and probably seemed more like the connection a junkie has with his dealer on Nintendo DS. I got so deep into my city and its inhabitants with Wild World's portability, that I took my DS to school and played with the stylus only, as if I were paying attention and taking notes, when my real dedication was to completing the Cabana set and keeping every flower watered. While City Folk rested too easily on the formula, Animal Crossing: New Leaf shirks the hanging horror of your debt to focus on new mechanics, friendlier social elements, and a true sense of progression to recapture addicts and newcomers alike. Hop off the train and city-hall assistant Isabelle will be there to greet you. Where Tortimer used to passively manipulate the town's helm in unseen ways, every decision in New Leaf will be made by you, the new mayor. It might sound like a lot of responsibility, but you can ignore your post if you like. The town will go under-developed, its denizens will abandon you, but at least you can still focus on your house and your own personal wealth if that's your prerogative. William Randolph Hearst had a pretty sweet pad, but what's the point of a second floor if no one comes over to visit? Animal Crossing never engages the selfish and uninvested, instead rewarding players who can develop a good habit out of maintaining their towns, not unlike a bonsai tree. Your town can be picturesque and idyllic, but only with careful pruning, watering, and a couple thousand Bells spent on public works projects. Most of your money will come from typical AC activities, like collecting fruit, catching fish and bugs, or playing the Turnip market, but playing smart will allow you to juggle several tasks at once. 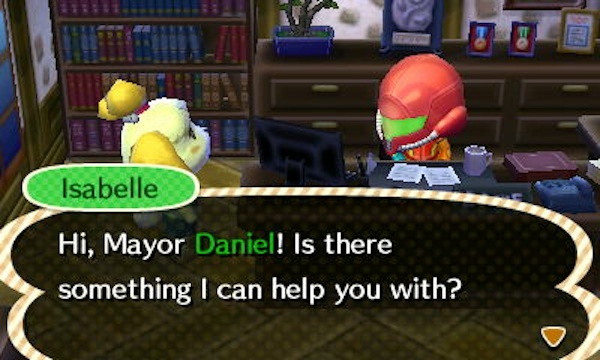 In the first week, I made sure to press Isabelle for further advice on keeping my town happy and vibrant. She'd suggested digging up fossils or talking to every neighbor, mostly advice for beginners, but then she had a request for me. Could I catch a specific bug for her? I obliged and was rewarded with an incredibly valuable foreign piece of fruit. On Gamecube, you could only get these by starting a second file or swapping memory cards with another gamer, but obtaining an Orange so early in New Leaf came as a surprise. Soon, I had gathered fruit from Tortimer's tropical island getaway and a few less exotic species from my animal friends in town, but to my surprise I still hadn't broken the game. I thought I'd be able to sit back and rely on orchards of Persimmons and Peaches turned into heaps of cash money in my bank account. Yes, I paid off an expansion to my house and completed a new suspension bridge in one part of town, but New Leaf simply refused to stop opening new doors. Despite earning money faster than I had in previous games, Nintendo managed to expand the formula without breaking the curve. You can spend countless Bells at Nookling Junction to grow it into a sprawling department store or on home-modifications and redesigns direct from Tom Nook. 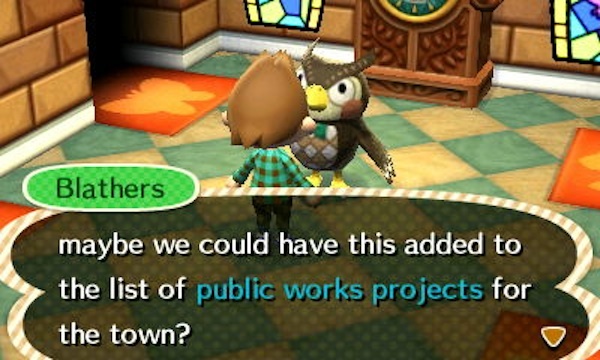 You can start a new public works project to add a campsite in your backyard or set an ordinance that requires shops to be open later to meet your busy schedule. Being the mayor creates a much deeper sense of responsibility and encourages further generosity of spirit, both of which are integral to following through on the promise every gamer makes to finish a complete year in AC. In my second week I'd established a dedicated rhythm of harvesting fish from the rivers and ocean. I felt like I was making the most cash as a master fisherman. I wanted to complete the museum exhibit and make my living pacing the sands for deep sea monstrosities to sell. I came in first in the fishing contest and redecorated my house with furniture won for repeatedly out-casting myself. I had my fishing vest, my rod, and I was happy, but Isabelle informed me that my loner-ism had turned off some of the other citizens. My favorite neighbor, Lolly, told me one Tuesday that she'd be leaving town in a week. I asked her to stay and promised to change my ways. I realized now why no one else had contributed to the suspension bridge project. I put it right in front of my house for easier ocean access, and the collection plate suffered for it. The piles of furniture I'd stored from Nookling Junction in the hopes of "collecting them all"? I started to mail it away to neighbors and only completed furniture sets after receiving gifts in return. The corners of town I'd forgotten and neglected? Weeded and replanted with flowers, even welcoming a few new neighbors. Instead of spending an hour on New Leaf every day, I'd cut my time to half an hour and refocused a steadier, less breakneck pace in paying off loans and projects. 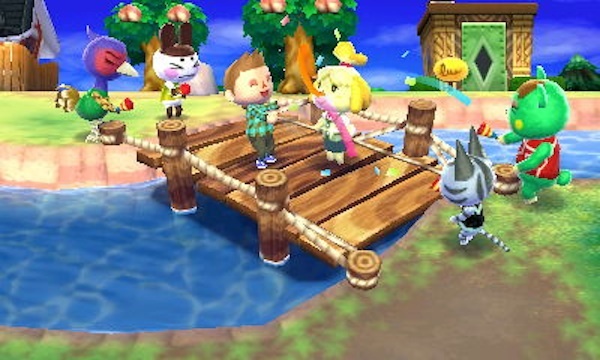 You can play Animal Crossing however you like, meaning New Leaf is literally all about creating your happy place. All the new mayoral mechanics make the experience feel more like a role-playing game than a straight simulation, giving you the chance to make rules and not just abide by them. I wasn't happy as a fishing-first mayor, but the blossoming town in front of me made the busy-bee mindset needed to attend to an entire population of animals worth it. You will absolutely get back what you put into New Leaf, and while that might be an intimidating prospect to adults with 9-5 jobs that pay in actual money, AC's return to portable makes it loads easier to keep up. Even Mr. Resetti has taken a sabbatical from reprimanding players who reset and play with the system clock (though you can start a lengthy public works project to bring him back). Even seemingly insignificant changes make huge differences. You can stack fruit in your inventory to maximize harvesting goods and your entire outfit can be customized, down to your socks. Buy a wet suit and you can go swimming in the ocean and dive for objects. Remember when every neighbor would demand an errand? You'll still find yourself making a delivery, but you might also be asked to play hide and seek instead. Nintendo's multiplayer set up is much improved as well, allowing users to share their homes via Streetpass, visit each other's towns via local or internet networks, and download new items, showcase homes, and more via Spotpass. It'd still be nice to add friends by a name and not friend codes to get a group together, but at least you don't have to mail a memory card like you did on Gamecube. Other goodies put a ribbon on the package. You can use Play Coins (the currency generated by walking around with your 3DS) to buy fortune cookies that allow you to trade fortunes for Nintendo-themed furniture and clothing. I'm currently decked out in the Varia suit, but my neighbors still recognize me through Samus's green visor. Like the NES consoles on Gamecube, these Nintendo trinkets are hugely motivating and will encourage lots of Streetpassing. Animal Crossing: New Leaf finally evolves and revitalizes the formula, expands on the way you interact with your town in meaningful ways, and more importantly returns the series to portable hardware. There are countless elements I haven't touched on here, but maybe in playing the game for yourself, you'll access them before I do. Giving players the choice of when and how the town should expand means you can be as aggressive or as passive as you like. Suddenly Animal Crossing isn't about debt if you don't want it to be; It feels more like you have an integral role in sheparding your town to its full potential. Whichever you prefer, let this animal bite you. Code provided by publisher. Exclusive to Nintendo 3DS. Still with the friend codes?